Ted Cruz convened hundreds of supporters Wednesday morning on the Lake Erie waterfront in Cleveland with the goal of simply thanking them but could not avoiding being overshadowed by presidential politics — literally. 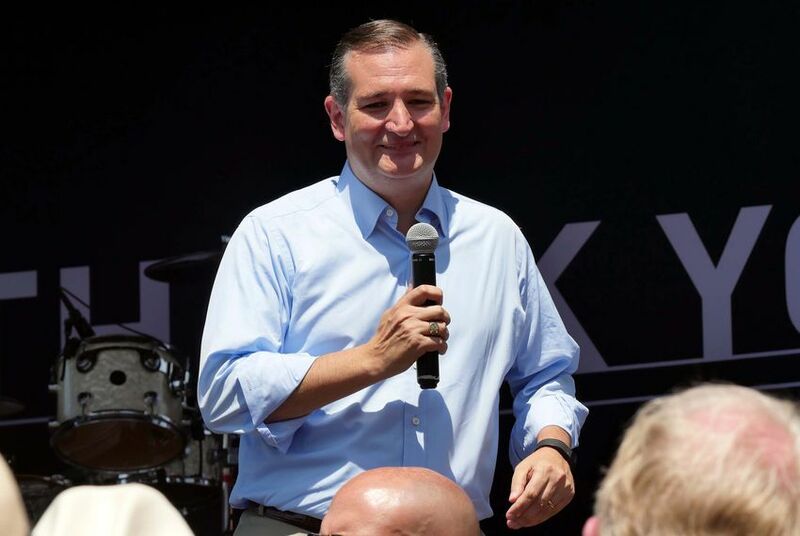 CLEVELAND — Ted Cruz convened hundreds of supporters Wednesday here on the Lake Erie waterfront with the goal of simply thanking them, but he could not avoiding being overshadowed by presidential politics — literally. As the U.S. senator from Texas acknowledged the GOP "now has a nominee" — his former bitter rival, Donald Trump — the New York billionaire's plane could be seen gliding through the sky above Cruz. Long, loud boos broke out as supporters soaked in the sight. "That was pretty well orchestrated," a chuckling Cruz remarked, turning toward former campaign manager Jeff Roe. "Jeff, did you email them to fly the plane right when I say that?" The reception otherwise went off without a hitch, with Cruz, who dropped out of the Republican presidential race in May, effusively praising his backers for sticking with him until the end. He offered no words of support for Trump, acknowledging the push for GOP unity but saying it will only be achieved by uniting "behind shared principles." "I don't know what the future is to hold. I don't know what's going to happen. But what I do know, what remains unshakeable is my faith in the men and women here," Cruz said. "What I do know is that every one of us has an obligation to follow our conscience, to speak the truth, and truth is unchangeable." Recalling the conclusion of his campaign, which came after a devastating loss in the Indiana primary, Cruz identified his biggest regret: not individually thanking every volunteer who worked for him. He confessed it was because he did not want reporters to catch him breaking down following the devastating loss. "I wasn’t going to let those SOBs turn Lyin’ Ted into Cryin’ Ted," Cruz said, evoking Trump's derogatory nickname for the Texas senator. The reception came hours before Cruz is set to address Republican National Convention in a speaking slot that Trump offered him in a meeting earlier this month. Cruz and Trump spoke again Tuesday, Roe told reporters before the Texas senator addressed the crowd here. The former campaign manager would not elaborate. Cruz is not expected to endorse Trump in the speech, but Roe said the remarks will be "unifying." Asked if Cruz mentions Trump by name in his speech, Roe said, "I think it's in there, I don't recall how we say it." "He doesn't tell people how to vote. He's just never done that," he said. "He's not really that kind of guy anyway. I think the values that make us strong as a party were on full display in his campaign and he gave a good run and got second place." In any case, Cruz's speaking slot will give him a platform to build his profile ahead of an already rumored do-over bid for the White House four years from now. Cruz's supporters seemed well aware of the prospect, at one point interrupting his remarks here with chants of "2020!"